Texas City is home to one of the longest man-made piers. At 5.3 miles long, Texas City’s dike extends far out into the Gulf and is a great place to get away from it all. We always find, however, that the best place to get away from it all is sitting in a church pew on Sunday. Taking the time to listen to the Word and gather with other Christians helps wash away all of the turmoil of the rest of the week—getting close to God in a church pew is really the best thing you can do. 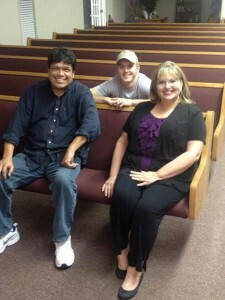 We love building church pews and meeting other Christians who have dedicated their lives to the Lord. 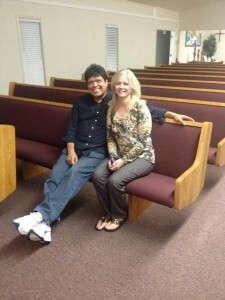 In Texas City, we installed church pews in the First Church of God. Nick, one of our team members, is shown in the above photo securing legs onto the finished church pews for installation. Our job is one of long, hard hours and lots of travel on the road but it’s well worth knowing that we provide a place of sanctuary for many people across the country. 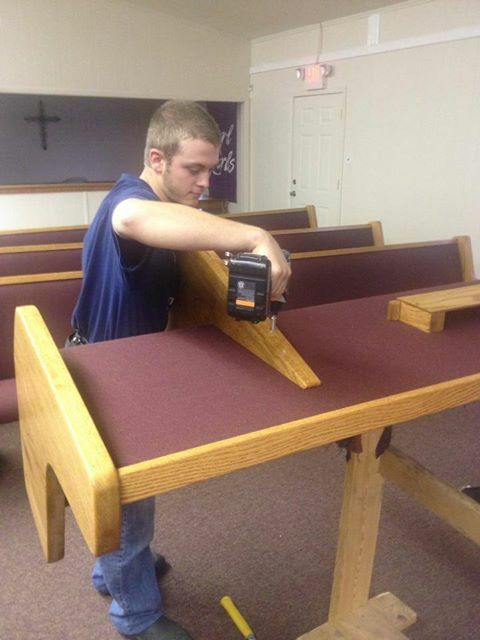 If your church is in need of new church pews, contact us to find out how we can help. These church pews for the First Church of God in Texas City are perfect for taking time to step away from the daily struggles we have and to think about God’s desires and plan for us. The church pews have a low arm rest and a relaxed profile—they’re perfect for a casual church atmosphere that asks congregants to come as they are. After all, God is with us every step of the way, whether we’re sitting in church pews or not. Meeting Pastor Johnny, Mrs. Susan, and Beverly was a pleasure and we hope to get to know your church as we now know First Church of God in Texas City. Is it planning time or stewardship season at your church? 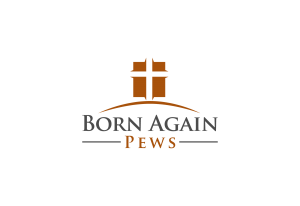 It might be time to think about new pews. We are always here to serve you.